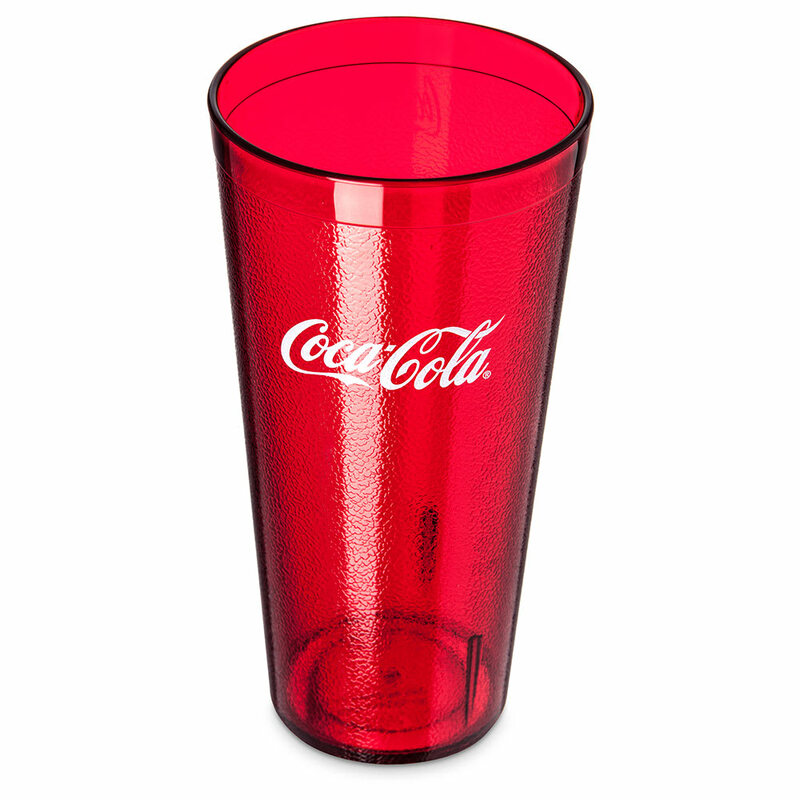 The Carlisle 52243550H tumbler comes in a bright shade of red with a white Coca-Cola logo on one side and a flush fill capacity of 26.5 ounces, allowing you to serve customers a generous 24-ounce portion of their preferred Coke products. Constructed of BPA-free SAN plastic, this tumbler resists breaking, chipping, and staining. The appearance of the cup is further protected by a textured exterior, which helps to hide the signs of wear and tear that are acquired during daily use. To make storing and transporting multiple cups easier, the Carlisle 52243550H tumbler is designed to stack. The tapered sides and interior stacking lugs prevent cups from sticking or jamming together, ensuring that servers or customers can pull them apart without trouble. This plastic tumbler is safe for temperatures ranging from 0 to 180 degrees Fahrenheit, so it can be cleaned and sanitized in a dishwasher. Overall Dimensions: 7.18 in. H x 3.63 in. top dia. x 2.63 in. bottom dia. "Great cup. Use for hot coffee and cold beverages." "I always wanted these glasses. I have four sons and we are always short.of glasses. These are durable and last!" "Easy to order and quick to deliver. The right product at the right price." "I fall in love with these cups every time I visit a restaurant or pizzeria, and finally decided to buy my own. The size (24oz) is perfect for entertaining because you can use a good amount of ice and still get a great amount of soda. Great for when I leave 2 liter bottles out for guests! 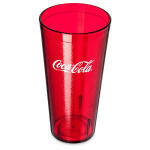 I would recommend this company and these Coke glasses to anyone and everyone!! If you're debating about purchasing these - YES!!!" "My product was delivered on time and in excellent condition. I am very happy with the quality of this product. It met or exceeded my expectations!" "I have been looking for these.....Great Price, fast delivery." "This cups are so durable, almost indestructible." "I couldn't be happier with my purchase. They are almost unbreakable which is great; especially if you have kids in the household"
"Cups I bought came fast and shipped with care. Awesome product and awesome site will be buying from there again."